It would be safe to assume that PDF or Portable Document Format is a convenient and widely supported format, specially if you wish to distribute documents that don’t have to be edited. The problem is that not all applications support exporting or printing to the PDF format natively. While plenty of online services will happily covert documents to other formats they usually come with inconveniences and the result may not look professional when a document is watermarked with the name of a third party. 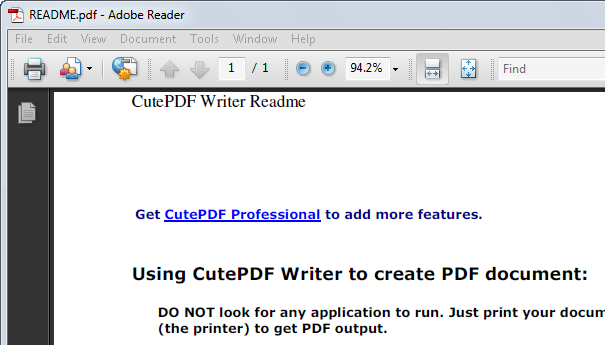 Meet CutePDF Writer a printer subsystem or in simple terms “CutePDF Writer is a plug-in that appears as if it was a printer, instead of a paper copy the result will be a PDF”, applications only have to support printing in order to use CutePDF Writer. 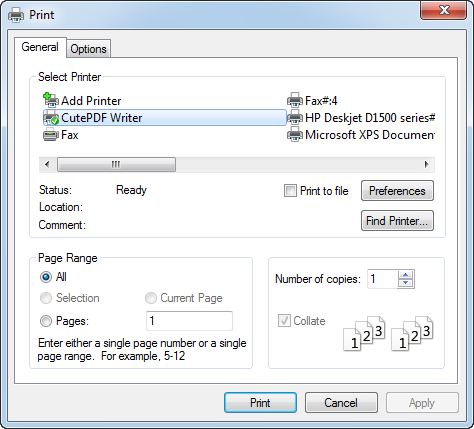 When the subsytem is installed you can choose between printing to a regular printer or CutePDF Writer. 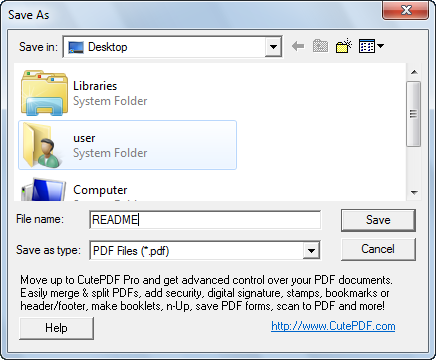 To start using the subsystem first you need to go over to cutepdf.com and download CutePDF Writer CuteWriter.exe and optionally the free PDF coverter coverter.exe. I say optionally because CuteWriter.exe alone has the capability of downloading converter.exe over the Internet and install it for you. However, if you do not expect to be near an Internet connection you should download both files. 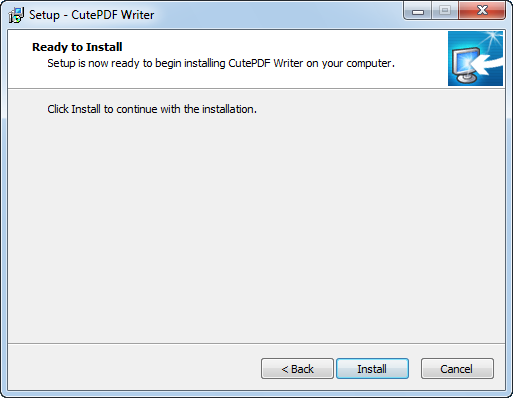 Once the download in complete, double click on CuteWriter.exe to start the installer. Begin the installation by clicking on the Install button. 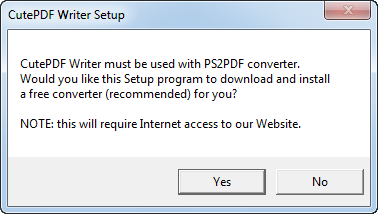 Since the CutePDF Writer installer did not find any sings of a PS2PDF on the system you are being given the option to automatically download and install coverter.exe for you. Click on Yes to install coverter.exe on the system. Internet connection required, allow some time for the download to complete. 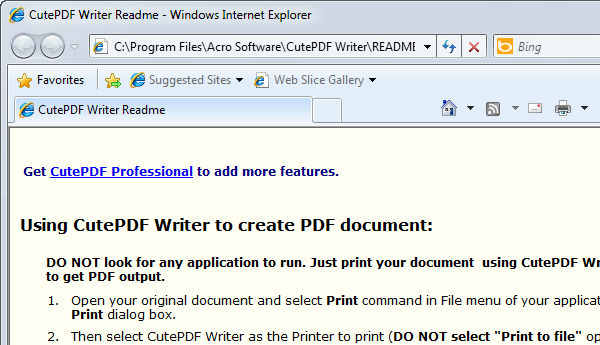 When CutePDF Writer and all of the components are installed you will be presented with a page in your browser explaining how to use it. We will use this page to print out first PDF. 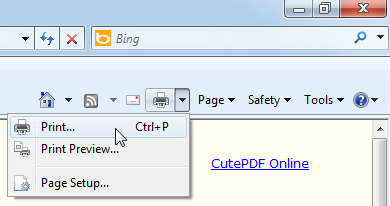 Let’s try it for the first time, depending on the browser you are using try to print a page or use Ctrl + P.
To print to a PDF select CutePDF Writer and hit the Print button. Name the document and select the location where the file will be saved. Go to the location where the file was stored and open it, as you can see the result is a PDF file. Saving documents to PDF could not be easier and might even help you save on the cost of printer ink. 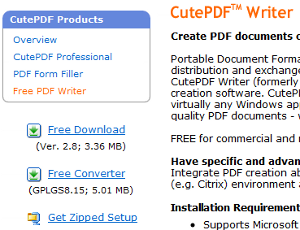 You have covered a lot of points here, but most important, CutePDF Writer is Free for commercial and non-commercial use. Love it.